Davao City—July 5, 2018—Honda Philippines, Inc. (HPI), the number one motorcycle manufacturer in the Philippines, held the first leg of the Honda Ride Red in Davao City. The off-road race event aims to take the extreme racing action into the dirt tracks with its three exciting categories, the XRM125 beginners and intermediate and XRM125 Ladies. Honda Ride Red will also bring serious excitement to off-road riders and enthusiasts around the country by showcasing the solid lineup of Honda Off-road series and letting everyone experience the fun of using Honda products. Among them are the XRM125 series, XR150L, CRF150L, CRF250L and CRF250 Rally. With Honda’s long history in off-road, HPI is excited to bring this action-packed racing event that sports enthusiasts will enjoy. The company looks forward to having people join and witness the fun and thrilling activities it has in store for them. HPI will hold six legs of Ride Red all-in-all. The second will be held on July 29, 2018 in General Santos, the third on September 23, 2018 in Bukidnon, the fourth on December 9, 2018 in Dumaguete, the fifth on January 27, 2019 in Tuguegarao and the sixth on February 10, 2019 in Rizal. 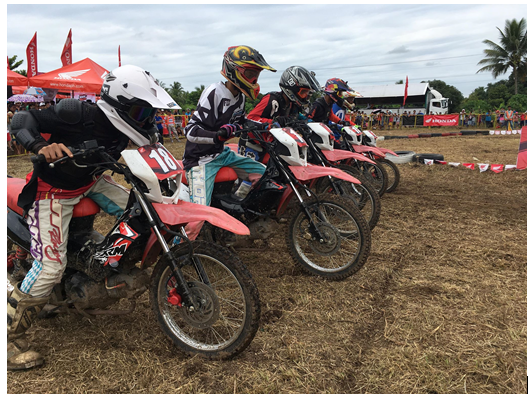 With this, Honda aims to make the thrill of off-road racing more accessible to Filipinos in different parts of the country. The Honda Ride Red is in line with HPI’s new ONE DREAM campaign. This drive aims to unite all motorcycle riders and carry over the goal of uniting Filipinos by serving as a tool in helping people achieve their dream through various activities that are suited for the young, fun, and fashionable millennials. Through the event, Honda also gives opportunity for riders to better understand the dynamics of motorcycling and to promote the sport among the Filipino youth. For more information, you can also follow Honda Philippines, Inc. on Facebook – www.facebook.com/hondaph/ or visit their official website – www.hondaph.com.